Regulated mucin secretion from specialized goblet cells by exogenous agonist-dependent (stimulated) and -independent (baseline) manner is essential for the function of the epithelial lining. Over extended periods, baseline release of mucin can exceed quantities released by stimulated secretion, yet its regulation remains poorly characterized. We have discovered that ryanodine receptor-dependent intracellular Ca2+ oscillations effect the dissociation of the Ca2+-binding protein, KChIP3, encoded by KCNIP3 gene, from mature mucin-filled secretory granules, allowing for their exocytosis. Increased Ca2+ oscillations, or depleting KChIP3, lead to mucin hypersecretion in a human differentiated colonic cell line, an effect reproduced in the colon of Kcnip3-/- mice. Conversely, overexpressing KChIP3 or abrogating its Ca2+-sensing ability, increases KChIP3 association with granules, and inhibits baseline secretion. KChIP3 therefore emerges as the high-affinity Ca2+ sensor that negatively regulates baseline mucin secretion. We suggest KChIP3 marks mature, primed mucin granules, and functions as a Ca2+ oscillation-dependent brake to control baseline secretion. Mucins, encoded by 21 different genes in mammals, are the major components of the mucus layer, which provides the first line of defense against pathogens and allergens to the lining of the respiratory, urinary, gastrointestinal and reproductive tracts (Boucher, 2007; Kesimer et al., 2013; Russo et al., 2006). Specialized epithelial goblet cells secrete gel-forming mucins (MUC2, MUC5AC, MUC5B and MUC6) that control the rheological properties of the mucus layer (Davis and Dickey, 2008; Kreda et al., 2012; Thornton et al., 2008). Mucins are synthesized in the endoplasmic reticulum (ER) where they undergo core glycosylation and reach up to 500 kDa in apparent molecular weight. The fully assembled mucins are then exported to the Golgi complex where, after extensive glycosylation, they reach sizes of up to 2.5 million daltons (Sheehan et al., 2004; Thornton et al., 2008). These heavily glycosylated mucins are then packed into secretory granules that can be up to a micron in size and occupy almost 75% of the cytoplasmic volume (Curran and Cohn, 2010). The granules mature to produce highly condensed mucins and finally a subset of granules fuse with the plasma membrane by SNARE-mediated fusion (Adler et al., 2013). In the extracellular space, condensed mucins undergo a change in their organization to a gel-like form to compose a layer of mucus that coats the extracellular surface of the epithelium (Thornton et al., 2008). Mucin granule exocytosis is a Ca2+-regulated process that can occur at basal level (Baseline Mucin Secretion, BMS) and by an exogenously supplied agonist dependent release (Stimulated Mucin Secretion, SMS) (Adler et al., 2013; Rossi et al., 2004). Importantly, baseline mucin secretion could be the preponderant mode of goblet cell mucin release in healthy tissue, and may contribute predominately to mucus formation in allergic and infectious inflammation (Zhu et al., 2015). The Ca2+ binding properties of the well-characterized Synaptotagmin 2 (Syt2: low affinity and high cooperativity (Xu et al., 2007)) provide the high fidelity necessary for stimulated secretion. Syt2, however, does not have a role in baseline mucin secretion (Tuvim et al., 2009). What then is the identity of the corresponding high-affinity Ca2+ sensor required for baseline (agonist-independent) mucin secretion? Our genome-wide screen identified new proteins that regulate mucin secretion, such as TRPM5, a Na+ channel that controls extracellular Ca2+ entry into cells (Mitrovic et al., 2013). Also identified in the pool of hits from this screen, was a high-affinity Ca2+-binding protein, KChIP3 (potassium voltage-gated channel interacting protein 3), also known as DREAM and Calsenilin (An et al., 2000; Buxbaum et al., 1998; Carrión et al., 1999), which is encoded by the gene KCNIP3. KChIP3 is a member of the neuronal Ca2+ sensor protein (NCS) family that codes a 29 kDa multifunctional Ca2+-binding protein (Carrión et al., 1999). It has three functional EF hands and can bind two Ca2+ ions with high affinity and another with lower affinity (Lusin et al., 2008; Osawa et al., 2005). Curiously, the Ca2+ regime under which KChIP3 senses Ca2+, at < 1 µM, is an order of magnitude lower than the levels required to regulate stimulated secretion, which is estimated at 10 µM in the vicinity of the exocytic machinery in goblet cells (Rossi et al., 2004; Yu et al., 2007). We therefore reasoned that KChIP3 could be the key to controlling baseline mucin secretion ordinarily associated with lower intracellular Ca2+ concentrations. In other words, while Syt2 functions in stimulated secretion as a low-affinity Ca2+sensor, KChIP3 could be the high-affinity Ca2+ sensor for baseline secretion. Here we demonstrate that KChIP3 is the Ca2+-sensing brake that controls agonist-independent baseline mucin secretion in tissue culture colonic goblet cells and in the mouse colon. Previously, we showed that differentiation of HT29-18N2 cells into mucin-secreting cells results in upregulation of mucins and many of the genes that are required for its secretion (Mitrovic et al., 2013). We re-tested mRNA levels of KChIP3 in differentiated HT29-18N2 goblet cells compared to undifferentiated cells. The data reveal a 3.3-fold increase in the mRNA levels of KChIP3 (Figure 1A). Next, we generated a stable HT29-18N2 cell line depleted of KChIP3 (KChIP3-KD) and a stable HT29-18N2 cell line expressing KChIP3 tagged with GFP at the C-terminus (KChIP3-GFP). RNA was extracted from differentiated control, KChIP3-KD and KChIP3-GFP HT29-18N2 cells and the levels of KChIP family members monitored by qPCR. KChIP3-KD cells showed an 80% reduction in KCNIP3 mRNA levels, while levels of the other KChIP family members were unaffected (Figure 1—figure supplement 1A). In addition, expression of KChIP3-GFP, which was confirmed by western blot (Figure 1—figure supplement 1B), did not significantly affect the levels of the other KChIP family members (Figure 1—figure supplement 1C). The commercial antibodies do not detect endogenous levels of KChIP3, therefore we can only provide a value of how much KChIP3 is overexpressed in KChIP3-GFP cell line compared to endogenous KChIP3 at the mRNA level. We used these cell lines to measure MUC5AC secretion in the absence (baseline) or presence (stimulated) of the physiological stimulus ATP (100 µM in a solution containing 1.2 mM CaCl2). After 30 min at 37°C, extracellular medium was collected and dot blotted with anti-MUC5AC antibody as described previously (Mitrovic et al., 2013). Within 30 min, our results reveal a strong (2.5-fold) increase in baseline mucin secretion from KChIP3-depleted cells (Figure 1B), but there was no effect on agonist (ATP)-induced (stimulated) MUC5AC secretion (Figure 1C). Conversely, overexpression of KChIP3 (KChIP3-GFP cells) produced a 30% reduction in baseline MUC5AC secretion (Figure 1D), without affecting ATP-dependent MUC5AC secretion (Figure 1E). KChIP3 levels regulate baseline MUC5AC secretion. (A) KChIP3 RNA levels from undifferentiated (UD) and differentiated (DF) HT29-18N2 cells normalized by GAPDH values. (B) Control (black circles) and KChIP3 stable knockdown cells (KChIP3-KD) (blue squares) were differentiated and incubated for 30 min at 37°C in the absence or presence of 100 µM ATP. Secreted MUC5AC was collected and dot blotted with an anti-MUC5AC antibody. Data were normalized to actin levels. The y-axis represents normalized values relative to the values of untreated control cells. (C) ATP-dependent MUC5AC secretion was calculated from the data in (B) as the difference between normalized baseline secretion and stimulated secretion for each condition. (D) Secreted MUC5AC from differentiated control (black circles) and KChIP3 overexpressing cells (KChIP3-GFP) (red circles) in the absence or presence of 100 µM ATP. (E) ATP-dependent MUC5AC secretion calculated from the data in (D) for each condition. (F) Immunofluorescence Z-stack projections of control, KChIP3-KD and KChIP3-GFP differentiated HT29-18N2 cells with anti-MUC5AC antibody (green) and DAPI (red). Scale bar = 5 µm. (G) The number of MUC5AC granules for control (black circles), KChIP3-KD (blue squares) and KChIP3-GFP (red circles) cells was quantified from individual immunofluorescence stacks using 3D analysis FIJI software. The y-axis represents the number of 3-D objects detected by the software divided by the number of cells in each field. (H) Volume of control (black), KChIP3-KD (blue) and KChIP3-GFP (red) MUC5AC granules was calculated from individual immunofluorescence stacks using 3D analysis FIJI software. The y-axis represents the volume of the granules in µm3. Abbreviations: UD: Undifferentiated HT29-18N2 cells, DF: Differentiated HT29-18N2 cells. *p<0.05, **p<0.01. MUC5AC secretion by colonic cancer cells is a good model system to study the mucin secretory pathway. Although MUC5AC is expressed at low levels in the gastrointestinal tract and upregulated in pathological conditions such as ulcerative colitis or parasitic infection (Forgue-Lafitte et al., 2007; Hasnain et al., 2011), under physiological conditions colonic goblet cells secrete MUC2. This raises the obvious question: is KChIP3 involved in baseline MUC2 secretion? We used the same procedure as described above to test MUC2 released into the medium in the absence of agonist, from differentiated KChIP3-KD, KChIP3-GFP and control HT29-18N2 cells. In accordance with our results with MUC5AC, KChIP3 levels significantly affected baseline MUC2 secretion. KChIP3-KD cells showed a 5.7-fold increase in baseline secretion compared to control cells, while KChIP3-GFP cells presented a strong decrease (70.2% reduction compared to control cells) (Figure 1—figure supplement 2A and B). These findings indicate that the secretion of gel-forming mucins from colonic goblet cells might follow a similar mechanistic pathway. Even though the effects of MUC2 secretion are higher, for the sake of simplicity, availability and the cost of reagents, we have monitored the release of MUC5AC in the following experiments, unless otherwise mentioned. Is the effect on MUC5AC secretion by KChIP3 depletion or overexpression perhaps due to changes in MUC5AC protein levels? Total cell lysate from KChIP3-KD, KChIP3-GFP and control cells was dot blotted with anti-MUC5AC antibody and we did not observe any obvious difference in the total MUC5AC intracellular levels, compared to control HT29-18N2 cells (Figure 1—figure supplement 2C and D). We then tested whether loss or overexpression of KChIP3 affected production of MUC5AC-containing secretory granules. Cells were imaged by confocal immunofluorescence microscopy with anti-MUC5AC antibody and analysed using FIJI software. Our results reveal that KChIP3-KD cells contained significantly fewer granules than control cells: 5.4 MUC5AC-containing particles/cell versus 13.7 particles/cell (p=0.0239), while the average size of the individual particles was not significantly reduced (0.90 µm3 in control cells to 0.51 µm3 in KChIP3-KD cells, p=0.2430). On the other hand, KChIP3-GFP overexpressing cells showed a dramatic accumulation of apical mucin granules, which was detected as an increase in the size of MUC5AC positive particles compared to control cells (1.60 µm3 in KChIP3-GFP cells compared to 0.90 µm3 in control cells, p=0.0038), however, we did not detect an appreciable change in the total number of granules (12.1 objects/cell in control versus 13.7 objects/cell in KChIP3-GFP cells, p=0.6115) (Figure 1F, quantification in Figure 1G and H). Altogether, our data reveal that KChIP3 depletion increases the baseline secretion of MUC5AC and MUC2 as demonstrated by an increase in extracellular mucin with a concomitant reduction in the number of intracellular MUC5AC-containing granules. Conversely, KChIP3-GFP overexpressing cells secrete considerably less MUC5AC and present accumulation of apical MUC5AC granules. How does KChIP3 function in the secretion of MUC5AC and MUC2? Is it related to its ability to bind Ca2+? To test this possibility, we evaluated the Ca2+-dependency of baseline mucin secretion. We measured intracellular Ca2+ levels with Fura-2AM dye in differentiated HT29-18N2 cells under baseline or stimulated secretion conditions (the absence or presence of physiological stimulus, ATP). Our data show that in the absence of stimulus, HT29-18N2 cells exhibit spontaneous intracellular Ca2+ oscillations (average of 30% of cells in 10 min) (Figure 2A, left panel) of lower amplitude and shorter in time compared to an ATP-dependent (100 µM ATP) Ca2+ response. In order to test the relevance of these oscillations to mucin secretion, we first identified the source of the Ca2+, to enable us the possibility of manipulating these oscillations. 1) Removal of extracellular Ca2+ (solution with 0.5 mM EGTA), increased the number of oscillating cells (96% of cells in 10 min) (Figure 2A, central panel) and 2) inhibition of ryanodine receptors (RYRs) (treatment with 10 µM dandrolene (Zhao et al., 2001)) reduced the number of Ca2+ oscillations (13% of cells in 10 min) in either Ca2+-containing extracellular solutions (Figure 2A, right panel and quantification of oscillations in Figure 2B) or in Ca2+-free extracellular solutions (Figure 2—figure supplement 1A and B). These data implicate internal Ca2+ stores (principally the ER) as the source of Ca2+ oscillations in goblet cells. Importantly, our data show that RYRs are involved in the generation and maintenance of these oscillations. Ca2+ oscillations in goblet cells control KChIP3 function. (A) Time course of Ca2+ responses (normalized FURA-2AM ratio) obtained in differentiated HT29-18N2 cells in resting conditions exposed to different extracellular buffers: 1.2 mM CaCl2 (left), 0.5 mM EGTA (center), or 10 µM dandrolene (right) (n = 30, inset shows a recording obtained from a single cell under each condition). (B) Percentage of cells oscillating in each condition during 10 min. Average values ± SEM are plotted as scatter plot with bar graph (N > 3) (black dots: 1.2 mM CaCl2, blue dots: EGTA, red dots: dandrolene). (C) Secreted MUC5AC collected from differentiated HT29-18N2 cells that were incubated for 30 min at 37°C with different buffers: 1.2 mM CaCl2 (black dots), 0.5 mM EGTA (blue dots) or 10 µM dandrolene (red dots). The y-axis represents relative values with respect to the values of control cells. Average values ± SEM are plotted as scatter plot with bar graph (N > 3). (D) Secreted MUC5AC from differentiated control (black circles) and KChIP3 stable knockdown cells (KChIP3-KD) (blue squares) collected after 30 min incubation at 37°C in the in the presence (1.2 mM CaCl2) or absence (0.5 mM EGTA) of extracellular Ca2+. Data were normalized to intracellular actin levels. The y-axis represents normalized values relative to the values of untreated control cells. (E) Secreted MUC5AC from control (black circles) and KChIP3 stable knockdown cells (KChIP3-KD) (blue squares) that were incubated for 30 min at 37°C with vehicle or 10 µM dandrolene (DAND) in the presence of extracellular Ca2+. Data were normalized to intracellular actin levels. The y-axis represents normalized values relative to the values of untreated control cells. (F) Secreted MUC5AC from differentiated control (black circles), KChIP3-GFP (red circles) and KChIP3-MUT (green circles) cells that were incubated for 30 min at 37°C in the in the presence (1.2 mM CaCl2) or absence (0.5 mM EGTA) of extracellular Ca2+. Data were normalized to intracellular actin levels. The y-axis represents normalized values relative to the values of untreated control cells. (G) Secreted MUC5AC from differentiated control (black circles), KChIP3-GFP (red circles) and KChIP3-MUT (green circles) cells after 30 min incubation at 37°C with vehicle or 10 µM dandrolene (DAND) in the presence of extracellular Ca2+. Data were normalized to intracellular actin levels. The y-axis represents normalized values relative to the values of untreated control cells. Abbreviations: EGTA: Buffer with 0.5 mM EGTA, DAND: 10 µM Dandrolene treatment. *p<0.05, **p<0.01, n.s. : not statistically significant. Next, we tested whether intracellular Ca2+ oscillations were involved in baseline mucin secretion. Briefly, differentiated goblet cells were incubated with vehicle, 0.5 mM EGTA or 10 µM dandrolene for 30 min at 37°C and MUC5AC secretion measured by the antibody-based dot blot procedure. Our results show that increased Ca2+ oscillations (EGTA treatment) correlate with increased baseline mucin secretion (60% higher than control), while fewer Ca2+ oscillations, in cells treated with 10 µM dandrolene, result in reduced baseline secretion (40% reduction) (Figure 2C). Altogether, these data suggest that intracellular Ca2+ oscillations play an important role in baseline mucin secretion. This implies the involvement of a Ca2+ sensor (Adler et al., 2013) that detects intracellular Ca2+ oscillations to regulate baseline mucin secretion. Our data on KChIP3 and RYR-dependent Ca2+ oscillations in mucin secretion and a recent description of a functional interaction between KChIP3 and neuronal RYR (Grillo et al., 2018), led us to test whether KChIP3 was the link between Ca2+ oscillations and mucin secretion. We considered two possibilities: Ca2+ oscillations control KChIP3 activity to regulate MUC5AC secretion or KChIP3 affects MUC5AC baseline secretion by controlling Ca2+ oscillations. To distinguish between these two possibilities, we first tested whether Ca2+ oscillations regulate KChIP3’s effect on baseline mucin secretion. Our results show that increasing Ca2+ oscillations by removing extracellular Ca2+ (EGTA solution) increased MUC5AC secretion in control but not in KChIP3-KD cells (Figure 2D). Furthermore, EGTA treatment abolished the differences in mucin secretion between control and KChIP3-KD cells (2.1 vs. 2.5 fold increase, respectively), suggesting that removal of KChIP3 brings cells close to their maximal baseline mucin secretion. Additionally, decreasing the number of Ca2+ oscillations (dandrolene treatment) equally reduced baseline mucin secretion in both control and KChIP3-KD cells (Figure 2E), suggesting that intracellular Ca2+ oscillations are key to baseline mucin secretion and that in the absence of these Ca2+ signals, KChIP3 disengages its function as modulator of baseline mucin secretion. Second, to test whether the link between KChIP3 and Ca2+ oscillations to regulate baseline mucin secretion relates to the Ca2+ binding capability of KChIP3 we generated a stable HT29-18N2 cell line overexpressing an EF-hand mutant KChIP3 (KChIP3-MUT), which is unable to bind Ca2+ (Carrión et al., 1999) (expression levels were tested by western blot, as shown in Figure 1—figure supplement 1B). Under normal basal Ca2+ conditions (1.2 mM CaCl2), differentiated KChIP3-MUT cells showed a similar reduction in baseline MUC5AC (Figure 2F) and MUC2 secretion (Figure 1—figure supplement 2B) as KChIP3-GFP cells (37% and 47% decrease compared to control, respectively) compared to control cells. 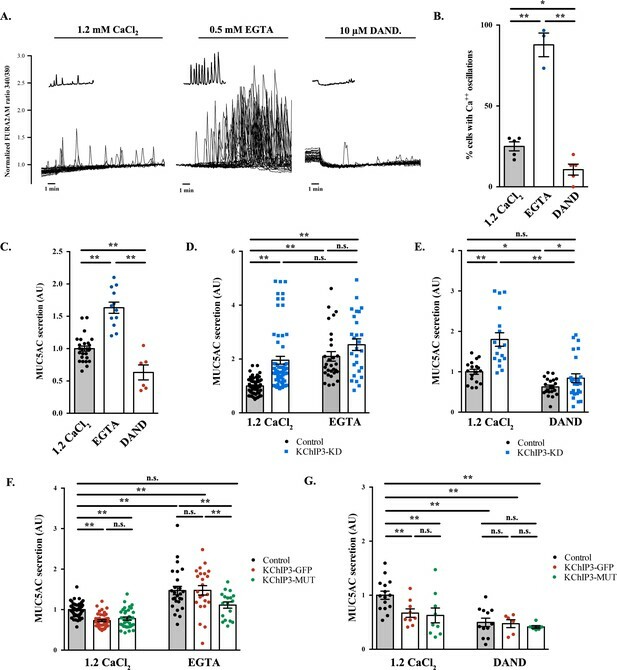 However, increasing intracellular Ca2+ oscillations (0.5 mM EGTA treatment) induced different behaviour of WT and mutant KChIP3-expressing cells. While KChIP3-GFP cells showed increased secretion of MUC5AC identical to control cells (47.1% increase in control cells vs. 47.6% in KChIP3-GFP cells), KChIP3-MUT cells only showed an 11.1% increased secretion (Figure 2F). On the other hand, reducing intracellular Ca2+ oscillations with dandrolene treatment markedly reduced MUC5AC secretion regardless of the form of KChIP3 overexpressed (Figure 2G). Together, these observations suggest that intracellular Ca2+ oscillations under control- unstimulated- conditions regulate baseline mucin secretion and that KChIP3 acts as a brake for mucin secretion. Knocking down KChIP3 increases while overexpression of KChIP3 decreases baseline mucin secretion. 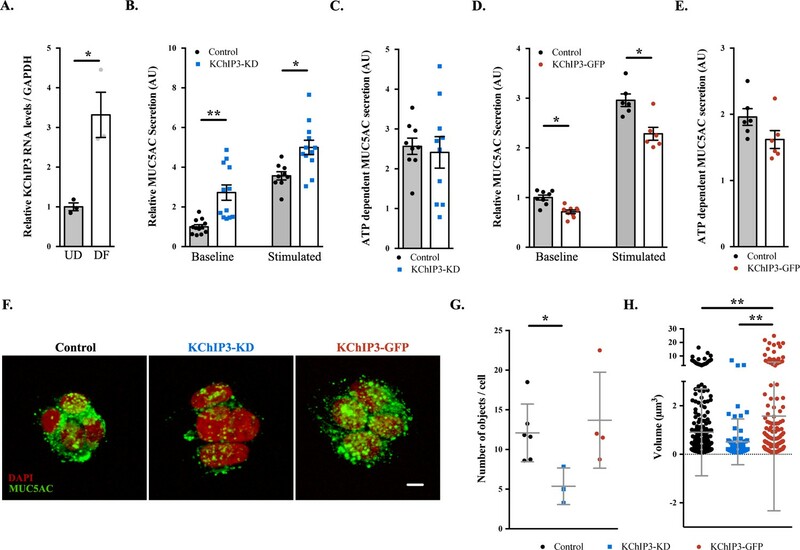 In addition, the role of KChIP3 in mucin secretion depends on basal intracellular Ca2+ signals and the ability of KChIP3 to sense such Ca2+ signals. Under conditions of low expression of KChIP3 (therefore a reduced brake capability and, consequently higher baseline mucin secretion), there is no further effect on secretion even with an increase in Ca2+ oscillations. On the contrary, overexpression of KChIP3 (increased brake capability) inhibits secretion and this effect is reverted by increasing Ca2+ oscillations, mainly in cells overexpressing KChIP3-GFP, but not KChIP3-MUT. We therefore conclude that both Ca2+ oscillations and KChIP3 function in the same pathway of baseline mucin secretion and Ca2+ oscillations likely control KChIP3 function. However, to completely discard the second possibility raised above, we tested whether KChIP3 had a role in the generation or maintenance of Ca2+ oscillations. We measured intracellular Ca2+ levels by Fura2-AM in HT29-18N2 cells depleted of KChIP3 (KChIP3-KD) or cells overexpressing KChIP3 (KChIP3-GFP) under baseline (15 min in 1.2 mM CaCl2) or stimulated conditions (10 min, 1.2 mM CaCl2, 100 µM ATP). Our results show no difference in basal Ca2+ levels (Figure 2—figure supplement 1C and D), ATP-dependent Ca2+ entry (Figure 2—figure supplement 1E and F), or in the number of cells exhibiting Ca2+ oscillations in KChIP3-KD or KChIP3-GFP cells compared to control cells (33% in KChIP3-KD, 37% in KChIP3-GFP, 30% in control cells) (Figure 2—figure supplement 1G). Thus, we conclude that KChIP3 has no role in the generation of spontaneous intracellular Ca2+ oscillations or ATP-mediated Ca2+ entry in HT29-18N2 goblet cells. Altogether, these results suggest that Ca2+ oscillations generated in goblet cells are sensed by KChIP3 to control baseline mucin secretion. We further propose that KChIP3 in its Ca2+-free form acts as a repressor for baseline mucin secretion. Based on the cell type and specific post-translational modifications including palmitoylation, sumoylation and GRK-dependent phosphorylation, KChIP3 is reported to be cytoplasmic, nuclear and/or located at the plasma membrane (Palczewska et al., 2011; Ruiz-Gomez et al., 2007; Takimoto et al., 2002; Zaidi et al., 2004). However, the intracellular localization of KChIP3 in non-excitable goblet cells has not been described before. We therefore tested the location of KChIP3 in differentiated HT29-18N2 cells (Figure 3). KChIP3-GFP cells and KChIP3-MUT cells were differentiated and seeded on coverslips. KChIP3-GFP and KChIP3-MUT cells were first permeabilized and washed extensively to remove the soluble cytoplasmic pool of KChIP3, thereby facilitating visualization of KChIP3 associated to the cytoplasmic face of intracellular compartments. Immunofluorescence microscopy with anti-KChIP3 antibody and anti-GFP antibody revealed presence of KChIP3-GFP and KChIP3-MUT on apical elements (Figure 3—figure supplement 1A, and co-localization between GFP and KChIP3 is shown in Figure 3—figure supplement 1B). KChIP3-containing punctae show significant colocalization with an apical pool of MUC5AC-containing granules. Our data reveal that 10 – 15% of total MUC5AC granules, detected by immunofluorescence (IF), contain KChIP3-GFP (Figure 3—figure supplement 1C, upper panel). Quantification of the images (using FIJI software, and described in materials and methods) revealed that in KChIP3-GFP cells under basal conditions, 40.6% of KChIP3 signal colocalized with MUC5AC (Average Manders’ coefficient = 0.4061) (Figure 3—figure supplement 1D). In accordance with the functional data presented in the previous section, KChIP3-MUT showed very similar localization to KChIP3-GFP and even higher colocalization with MUC5AC granules (59% of KChIP3-MUT signal colocalizing with MUC5AC under basal conditions) (Figure 3—figure supplement 1C, lower panel; quantification in Figure 3—figure supplement 1F). These data suggests that KChIP3 associates with a pool of mucin granules in a Ca2+-free form. KChIP3 localized to a pool of MUC5AC granules. Differentiated KChIP3-GFP (A) and KChIP3-MUT (B) cells were processed for cytosolic washout after 30 min at 37°C of treatment with 1.2 mM CaCl2, 0.5 mM EGTA or 10 µM dandrolene. After fixation and permeabilization, samples were analyzed by immunofluorescence microscopy with an anti-GFP (KChIP3, red), anti-MUC5AC antibody (MUC5AC, green) and DAPI (blue). Images represent a single plane (xy), a zoom of the area within the white square and an orthogonal view of each channel (xz). Scale bar = 5 µm. White arrows point to the colocalization between KChIP3 and MUC5AC. Abbreviations: EGTA: Buffer with 0.5 mM EGTA, DAND: 10 µM dandrolene treatment. We then tested whether localization of KChIP3-GFP and KChIP3-MUT to the apical pool of MUC5AC-containing granules depends on intracellular Ca2+ oscillations. We analysed KChIP3 localization after 30 min at 37°C under normal conditions (vehicle, 1.2 mM CaCl2), increased Ca2+ oscillations (solution with 0.5 mM EGTA), or decreased oscillations (10 µM dandrolene treatment). Our data show that the percentage of KChIP3 colocalizing with MUC5AC granules remains stable over time (KChIP3-GFP: 41% at t = 0 vs. 46% at t = 30’, Figure 3A left panel, KChIP3-MUT: 59% at t = 0 vs. 51% at t = 30’, Figure 3B left panel) under normal conditions. Interestingly, increasing the number of the oscillations by EGTA treatment for 30 min at 37°C, reduced the number of KChIP3-GFP positive granules (Figure 3A, central panel) (quantified in Figure 3—figure supplement 1E as the volume of KChIP3 signal, 12 µm3 vs. 4.4 µm3, respectively) and colocalization with MUC5AC (34% control vs. 19% EGTA treated cells), but it did not have any effect on KChIP3-MUT localization to granules (Figure 3B central panel) (52% in control vs. 54% in EGTA treated cells colocalization with MUC5AC, Figure 3—figure supplement 1F) or the number of KChIP3 granules (12.4 vs. 12.3 µm3, Figure 3—figure supplement 1G). Finally, reducing the number of Ca2+ peaks did not significantly affect the number of KChIP3 accumulations or colocalization to MUC5AC granules in KChIP3-GFP (Figure 3A right panel, quantifications in Figure 3—figure supplement 1D and E) or KChIP3-MUT cells (Figure 3B, quantification in Figure 3—figure supplement 1F and G). In sum, our data show that intracellular Ca2+ oscillations regulate KChIP3 localization at MUC5AC granules: Increase in Ca2+ oscillations reduces KChIP3 localization to MUC5AC granules, whereas impairing Ca2+ binding to KChIP3 results in more KChIP3-containing MUC5AC granules. KChIP3, encoded by the gene Kcnip3, is expressed in the colon of wild type (WT) mice and its deletion (Kcnip3-/- mice) does not affect the levels of the other members of the family (Figure 4—figure supplement 1A). Kcnip3-/- mice are reported to exhibit decreased chronic neuropathic or inflammatory acute pain behaviours, without any major defects in locomotion, learning or memory (Cheng et al., 2002). However, other effects of KChIP3 loss on the overall mouse physiology are not known. Based on our data showing that KChIP3 controls baseline mucin secretion from colonic goblet cells, we tested the effects of KChIP3 deletion on the levels of mucins in the colon-specific mucus layer under -non stimulatory- baseline conditions. Colons were extracted from 12-week-old WT and Kcnip3-/- mice (N = 6 per genotype), fixed by the standard methanol-carnoy method (as described in (Johansson and Hansson, 2012)) and stained with Periodic acid–Schiff (PAS) or Periodic acid–Schiff - Alcian blue (PAS-AB) to detect acidic and neutral mucins in the medial and distal colon. The PAS staining procedure is also used to detect glycogen and other glycoproteins, however, combination of both PAS and Alcian-Blue is the most sensitive method to detect mucins because these reagents detect all mucins regardless of their charge (Mantle and Allen, 1978). 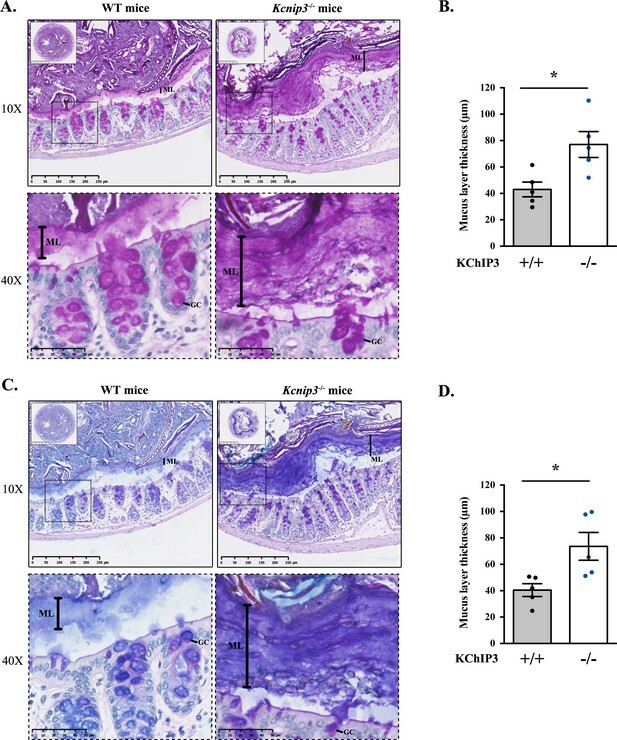 Impressively, distal colon of Kcnip3-/- mice revealed significantly increased levels of mucus layer compared to WT mice for both PAS (43.0 µm control vs. 77.0 µm Kcnip3-/-) (Figure 4A and B) and PAS-AB (40.5 µm in WT mice vs. 73.6 µm in Kcnip3-/- mice) (Figure 4C and D). In addition, this increase in the mucus layer was also detected in the medial colon of four out of five Kcnip3-/- mice (average thickness, PAS: 31.6 µm WT mice vs. 50.3 µm Kcnip3-/- mice, NS; PAS-AB: 33.6 µm WT mice vs. 54.0 µm Kcnip3-/- mice, NS) (Figure 4—figure supplement 1B–D). Kcnip3-/- mice show increased mucus layer thickness. (A, C) Representative distal colons of WT (left panel) and Kcnip3-/- (right panel) mice stained with PAS (A) or PAS-AB (C) at different magnification (2.5X, 10X and 40X). (B, D) Quantification of the mucus layer thickness in the distal colon stained with PAS (B) or PAS-AB (D) of WT (black dots) and Kcnip3-/- (blue dots) mice. Average values ± SEM are plotted as scatter plot with bar graph. The y-axis represents the thickness of the mucus layer in µm. Abbreviations: +/+: WT mice, -/-: Kcnip3-/- mice, ML: Mucus layer, GC: Goblet cell. *p<0.05. Homeostatic control of cellular protein secretion is essential, as evinced by the effects of dysregulated secretion of neurotransmitters, cytokines, insulin, hormones and mucins on organismal physiology. Specialized goblet cells release heavily glycosylated mucins from stored granules via exogenously applied agonist-dependent and -independent pathways. The former pathway is a form of acute response to protect epithelial lining when exposed to pathogens or allergens. The agonist-independent pathway however, is for chronic, continuous release of mucins at a low rate. Recent studies suggest that baseline secretion can release mucins in quantities that exceed several-fold, the amounts released by the agonist-mediated process over a 24 hr period (Zhu et al., 2015). While both of these pathways are poorly studied, our understanding of how cells control baseline mucin secretion is relatively even more primitive. In a nutshell, all that is known at present about baseline mucin secretion in human bronchial epithelial cells and mouse trachea is the involvement of SNAP23 and Munc13-2, which also regulate stimulated secretion (Ren et al., 2015; Zhu et al., 2008). It is also known that baseline mucin secretion is independent of Syt2 and sensitive to mechanical stress (Zhu et al., 2015). But how is baseline mucin secretion controlled to prevent pathological quantities of secreted mucins? Our data reveal a linear pathway whereby spontaneous cellular Ca2+ oscillations trigger KChIP3 detachment from mucins granules and promote mucin secretion in an agonist-independent manner. We propose KChIP3 as the high-affinity calcium sensor to control baseline mucin secretion. KChIP3 according to our data is a negative regulator of baseline mucin secretion. Syt2, on the other hand, is the low-affinity calcium sensor that acts positively to regulate stimulated mucin secretion (Tuvim et al., 2009). Why is baseline mucin secretion controlled by a negative regulator? One possibility is that mature granules for baseline secretion are already docked at plasma membrane and ready to release their contents. The only means, therefore, to prevent their fusion is by employing a brake –a negative regulator– such as KChIP3. Another possibility that we cannot exclude is that KChIP3 competes with a positive regulator, like synaptotagmins, to control baseline mucin secretion. In addition, we propose that even though there are notable differences in the proposed mechanisms of mucin secretion between colonic and airway cells, the function of KChIP3 is conserved in mucin secreting goblet cells regardless of the tissue. For example, both stimulated and baseline secretion in the airways are affected by shear stress (airflow and mucus movements promoted by ciliated cells), but are independent of extracellular Ca2+ (Davis and Dickey, 2008; Tuvim et al., 2009). In the intestine, there are two layers of mucus, an outer loose layer and an inner adherent layer of MUC2 (which is free of pathogens) (Johansson et al., 2011), and extracellular Ca2+ is required for stimulated secretion (Mitrovic et al., 2013). Nevertheless, mucin secretion in both airways and the colon requires intracellular Ca2+. Altogether, this suggests the existence of a low affinity Ca2+ sensor for stimulated secretion and a high affinity Ca2+ sensor for baseline secretion regardless of the tissue type. KChIP3, as the high affinity Ca2+ sensor, therefore likely plays an important role in the physiology and pathophysiology of colon, the airways and consequently in mucin related pathologies such as asthma, cystic fibrosis and COPD. The first key, novel data presented here are the exhibition of spontaneous Ca2+ oscillations in goblet cells. These oscillations arise from Ca2+ release from internal stores (mainly ER), in a ryanodine receptor (RYR)-dependent manner. By modulating the frequency of Ca2+ oscillations, we could perturb the release propensity of mucin granules in goblet cells. It is known that RYRs promote Ca2+ release from the ER, which is necessary for several Ca2+-dependent intracellular functions (Van Petegem, 2012). Our findings reveal an important new function of these intracellular Ca2+ oscillations as a means to control quantities of mucin secreted by goblet cells. We propose that goblet cells exhibit regulated secretory activity in two different regimes of intracellular Ca2+: 1) a steady, moderated release (baseline) using intracellular stores to mildly elevate Ca2+ levels (oscillations) and, 2) a burst of secretion (stimulated) in response to potent physiological stimuli (ATP, for example) or pathogenic insults (for instance, allergenic) with a sizable influx of extracellular Ca2+. This also helps resolve the controversy on the source of Ca2+ for mucin release: extracellular Ca2+ is used to control stimulated release, whereas intracellular Ca2+ is employed to manage baseline mucin secretion. In neurons, KChIP3 alters ER calcium content and RYR-mediated Ca2+-induced Ca2+ release (CICR) by direct interaction with RYR receptors (Grillo et al., 2018; Lilliehook et al., 2002). As shown here, in HT29-18N2 goblet cells, modulating KChIP3 levels did not perturb intracellular Ca2+ homeostasis, but the localization of KChIP3 to granules is controlled by Ca2+ oscillations. It is reported that ER is in close proximity to mucin granules in goblet cells (Tuvim et al., 2009), which presents the possibility that by directly interacting with RYR, the activity and location of KChIP3 is affected by an ER-based Ca2+ oscillations. KChIP3 in this manner couples Ca2+ release from ER to baseline mucin secretion. Thus, the second discovery presented here is that KChIP3 localization to granules and its function is linked to Ca2+ oscillations. Increasing Ca2+ oscillation frequency reduces the fraction of mucin granules bearing KChIP3, which correlates with an increase in baseline mucin secretion. Furthermore, overexpressing KChIP3 or a mutant KChIP3 that cannot bind Ca2+ reduces baseline mucin secretion. Loss of KChIP3, on the other hand, creates mucin hypersecretion. Based on our findings, we suggest that Ca2+-bound KChIP3 is soluble and cytoplasmic: under these conditions the cells release more mucins from the secretory granules. This hypersecretory phenotype is mimicked by cells having more Ca2+ oscillations, with a concomitant decrease in the number of KChIP3 containing granules. Cells overexpressing KChIP3-GFP on the other hand release less mucins and accumulate apical mucin granules. It could be argued that modulation of calcium oscillations changes mucin granule’ composition and this somehow affects KChIP3 localization. This is unlikely because the location of KChIP3-MUT, which cannot bind Ca2+, is unaffected by perturbing Ca2+ oscillations. Whereas, the wild type KChIP3-GFP location changes as per the status of the Ca2+ oscillations. Also, the fast kinetics of the recruitment and release of KChIP3 under our experimental conditions strongly suggest that the changes in KChIP3 location presented here are unlikely due to in changes in granule composition. How does the attachment of KChIP3 to the granules inhibit their release propensity? We suggest a parsimonious model, that granule-bound KChIP3 inhibits events leading to SNARE-mediated fusion. Whether this is by sequestering Ca2+, competing with the proteins of the SNARE complex or with regulators of the SNARE assembly such as Munc13-2, is an important new challenge. It is known that proteins like synaptotagmins act as low affinity Ca2+ sensor in the agonist-dependent release at the nerve terminal and in non-excitable goblet cells. 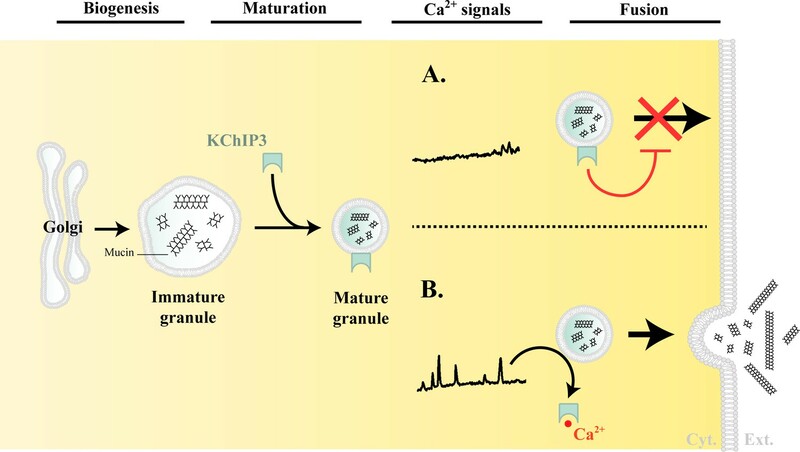 KChIP3, we propose, is the high affinity Ca2+ sensor that controls release propensity of mucin granules in non-excitable goblet cells in the absence of stimuli. It is possible that KChIP3 also has a role at the nerve terminal and in the extracellular Ca2+ independent release of cargoes that are stored in secretory granules. Altogether, we suggest that Ca2+ oscillations generated in the proximity of mucin granules from the ER, and not small increases in mean cytoplasmic calcium concentration, reach a certain threshold (provided by KChIP3’s Ca2+ binding properties) to trigger baseline mucin secretion. We hypothesize that binding of Ca2+ to KChIP3 changes its conformation thereby affecting its interaction to mucin granules. This, we suggest, is analogous to KChIP3’s association to DRE sites where it acts as a transcriptional repressor. In this scheme, KChIP3 bound to Ca2+ dissociates from DRE sites (Carrión et al., 1999). However, further work is needed to assess whether this proposed Ca2+ dependent conformational change that triggers dissociation from the granules is due to changes in the binding affinity of KChIP3 to granules or a change in its binding partners at the granules. It is satisfying to note that the effects of loss of KChIP3 on mucin hypersecretion by colonic goblet cells in culture are replicated in the colon of Kcnip3-/- mouse. Both in the medial and distal colons of 12 week old Kcnip3-/- mice, there is a clear increase in the mucus layer thickness, from an average of 40 µm in wild type to 80 µm in Kcnip3-/- mice. 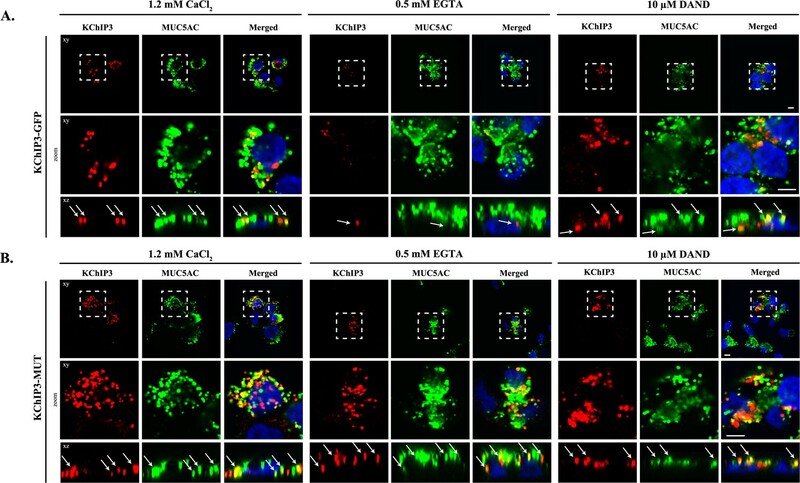 However, the increased extracellular pool of mucins in Kcnip3-/- mouse in the images shown might be perceived not to correlate to a decrease in intracellular mucin content within the goblet cells. The likely reason for this apparent disconnect is our inability to distinguish between mucins secreted into the colonic crypt and the intracellular mucins in the colonic epithelium. This can only be addressed reliably in cells isolated from the colon of the wild type and Kcnip3-/- mouse followed by separating extracellular pool of mucins from the cells, and subsequently quantitating the intracellular and extracellular pool by dot blotting as we have shown here for the colonic cancer cells. This is technically extremely challenging, but regardless of this potential shortcoming, the data clearly point to a significant increase in the extracellular pool of colonic mucins in Kcnip3-/- mouse compared to their wild type counterparts. Additionally, the colonic mucus layer in Kcnip3-/- mice seems denser (Figure 4), suggesting that the viscoelastic properties of the gel-forming mucins are also altered. Accumulated mucin in Kcnip3-/- mice colon creates a more compact mucous, which is likely to be detrimental for overall gut physiology. Based on the data presented here, we propose the following model for the regulation of mucin granule secretion (Figure 5). Post biogenesis at the Golgi, mucin granules undergo maturation and are placed on path to fuse with the plasma membrane and release their contents. However, the mature granules recruit KChIP3 (unbound to Ca2+) and this event stalls their fusion to the plasma membrane. KChIP3 recruitment thus acts as a brake to control the number of granules that can fuse with the plasma membrane. Based on our findings we describe two situations: (A) In absence of intracellular Ca2+ oscillations, KChIP3 is bound to the granules preventing their secretion, and (B) Upon a rise in intracellular Ca2+ by RYR-induced Ca2+ oscillations, the KChIP3 on the granules binds Ca2+ and subsequently detaches thereby triggering their SNARE dependent fusion to the plasma membrane. The cells have therefore evolved a mechanism by imposing the recruitment of empty KChIP3 to mucin granules to stall their progression leading to fusion with plasma membrane. Abbreviations: Cyt. : cytosol, Ext. : extracellular medium. Granule biogenesis and maturation: Heavily glycosylated mucins are sorted and packaged into micron-sized granules at the TGN. These granules undergo a number of maturation steps including condensation of mucins by a Ca2+-dependent process (Perez-Vilar, 2007). How mucins are sorted and packed into granules, or how granules are generated from the Golgi, remains unknown. There are no specific markers of the granules to identify and distinguish different stages of their maturity. We propose that membrane-anchored KChIP3 defines a mature subset of granules that are stalled in events leading to fusion. A RYR-mediated Ca2+ spike increases local cytoplasmic Ca2+ concentration that results in binding of Ca2+ to KChIP3 followed by its detachment from the granules. The dissociation of KChIP3-Ca2+ from granules disengages the brake holding granules from fusion, thereby resulting in mucin release. Spontaneous Ca2+ oscillations are unlikely to be of the amplitude to involve low-affinity Ca2+ binding sensor like the Syt2. KChIP3 might then be the key calcium sensor that functions instead of proteins like synaptotagmins to control baseline mucin secretion. Physiological or pathological stimuli that result in a massive increase in intracellular Ca2+ involve Syt2, which is a low-affinity Ca2+ sensor to control release propensity of the granules (Tuvim et al., 2009). In this regime, we propose that KChIP3 is in Ca2+-bound form and detached from mature granules. In conclusion, specialized secretory cells based on the source of Ca2+ engage different Ca2+ binding proteins to release cargoes from the secretory granules. The agonist and extracellular Ca2+-dependent fast release employs low-affinity Ca2+ sensors like Syt2, whereas the agonist-independent and intracellular Ca2+ oscillations exploit the function of a high-affinity Ca2+ sensor like KChIP3. In the last three decades, we have gathered a detailed understanding of synaptotagmin’s function as a clamp for fast Ca2+ evoked release. The challenge is to unravel the mechanism by which KChIP3 permits the quantities of mucins released, and likely many other cargoes, to balance the physiological needs of an organism. All chemicals were obtained from Sigma-Aldrich (St. Louis, MO) except anti-MUC2 antibody clone 996/1 (RRID:AB_297837) (Abcam, Cambridge, UK), anti-MUC5AC antibody clone 45M1 (RRID: AB_934745) (Neomarkers, Waltham, MA) and anti-KChIP3 antibody (RRID:AB_10608850) (Santa Cruz Biotechnology, Texas, USA). Secondary antibodies for immunofluorescence microscopy and dot blotting were from Life Technologies (ThermoFisher Scientific, Waltham, MA, USA). HT29-18N2 cells (obtained from ATCC) (RRID:CVCL_5942) were tested for mycoplasma contamination with the Lookout mycoplasma PCR detection kit (Sigma-Aldrich, St. Louis, MO). Mycoplasma negative HT29-18N2 were used for the experiments presented here. HEK293T cells (ATCC, negative for mycoplasma) were co-transfected with the plasmid, VSV-G, pPRE (packaging) and REV by Ca2+ phosphate to produce lentiviruses. 48 hr post transfection, the secreted lentivirus was collected, filtered and directly added to HT29-18N2 (HT29-18N2 full description as above) cells. Stably infected HT29-18N2 cells with the different constructs were sorted for GFP signal by FACS. Differentiated HT29-18N2 control, KChIP3-KD, KChIP3-GFP, and KChIP3-MUT cells were lysed and total RNA extracted with the RNeasy extraction kit (Qiagen, Netherlands). cDNA was synthesized with Superscript III (Invitrogen). Primers for each gene (sequence shown below, Table 1) were designed using Primer-BLAST (NCBI) (Ye et al., 2012), limiting the target size to 150 bp and the annealing temperature to 60°C. To determine expression levels of KChIP1, KChIP2, KChIP3 and KChIP4, quantitative real-time PCR was performed with Light Cycler 480 SYBR Green I Master (Roche, Switzerland) according to manufacturer’s instructions. HT29-18N2 cells were differentiated to goblet cells as described previously (Mitrovic et al., 2013). Briefly, cells were seeded in complete growth medium (DMEM complemented with 10% FCS and 1% P/S), and the following day (Day zero: D-0), the cells were placed in PFHMII protein free medium (GIBCO, ThermoFisher Scientific, Waltham, MA, USA). After 3 days (D-3), medium was replaced with fresh PFHMII medium and cells grown for 3 additional days. At day 6 (D-6) cells were trypsinized and seeded for the respective experiments in complete growth medium followed by incubation in PFHMII medium at day 7 (D-7). All experimental procedures were performed at day 9 (D-9). HT29-18N2 cells were differentiated for 6 days and then split into 6-well plates. After one day (D-7), medium was exchanged with fresh PFHMII medium and cells grown for 2 more days. On D-9, cells were washed with isotonic solution containing: 140 mM NaCl, 2.5 mM KCl, 1.2 mM CaCl2, 0.5 mM MgCl2, 5 mM glucose, and 10 mM HEPES (305 mosmol/l, pH 7.4 adjusted with Tris); and then treated with vehicle (baseline secretion) or 100 µM ATP (stimulated secretion) for 30 min at 37°C. Ca2+-free solutions were obtained by replacing CaCl2 with equal amounts of MgCl2 and 0.5 mM EGTA. In order to inhibit RYR, cells were treated for 10 min with 10 µM dandrolene prior to start the secretion assay. During the secretion assay, cells were treated either with the drug or the respective vehicle. After 30 min at 37°C, extracellular medium was collected and centrifuged for 5 min at 800xg at 4°C. Cells were washed 2X in PBS and lysed in 2% Triton X-100/PBS for 1 hr at 4°C and centrifuged at 14000xg for 15 min. Extracellular medium and cell lysates were spotted on nitrocellulose membranes (0.45 µm) using Bio-Dot Microfiltration Apparatus (Bio-Rad, California, USA) (manufacturer’s protocol) and membranes were incubated in blocking solution (5% BSA/0.1% Tween/PBS) for 1 hr at room temperature. The blocking solution was removed and the membranes were incubated with an anti-MUC5AC antibody diluted 1:2000 or the anti-MUC2 antibody diluted 1:4000 in blocking solution, overnight at 4°C. Membranes were then washed in 0.1% Tween/PBS and incubated with a donkey anti-mouse or anti-rabbit HRP coupled antibody (Life Technologies) for 1 hr at room temperature. For the detection of ß-actin and KChIP3, cell lysates were separated on SDS-PAGE, transferred to nitrocellulose membranes and processed as described for the dot blot analysis using the anti-ß-actin (RRID:AB_476692), anti-KChIP3 (RRID:AB_10608850) or anti-GFP antibody (RRID:AB_390913) at a dilution of 1:5000, 1:500 and 1:1000 in 5% BSA/0.1% Tween/PBS, respectively. Membranes were washed and imaged with LI-COR Odyssey scanner (resolution = 84 µm) (LI-COR, Nebraska, USA). Quantification was performed with ImageJ (FIJI, version 2.0.0-rc-43/1.51 g) (Schindelin et al., 2012). The number of experiments was greater than three for each condition, and each experiment was done in triplicates. Differentiated cells (control, KChIP3-KD or KChIP3-GFP) were grown on coverslips and to visualize intracellular MUC5AC granules, cells were washed with 1x PBS and fixed with 3% PFA/PBS for 30 min at room temperature. Cells were then washed with PBS and permeabilized for 10 min with 0.2% triton X-100 in 4% BSA/PBS. The anti-MUC5AC antibody was added to the cells at 1:5000 in 4% BSA/PBS overnight at 4°C. Next, cells were washed with PBS and incubated for 60 min at room temperature with a donkey anti-mouse Alexa Fluor 555 coupled antibody (Life Technologies), diluted at 1:1000 in 4% BSA/PBS, and DAPI (1:20000). Finally, cells were washed in PBS and mounted in FluorSave Reagent (Calbiochem, Billerica, MA). Images were acquired using an inverted Leica SP5 confocal microscope with a 63x Plan Apo NA 1.4 objective and analyzed using ImageJ (FIJI, version 2.0.0-rc-43/1.51 g) (Schindelin et al., 2012). For detection, the following laser lines were applied: DAPI, 405 nm; and Alexa Fluor 555, 561 nm. To determine the number and volume of MUC5AC positive elements, we used the 3D objects counter v2.0 tool from FIJI (Bolte and Cordelières, 2006). All images analysed were taken on the same day under the same conditions and the same Z-step (0.29 µm). The parameters used follow: a) Size filter between 100 – 37748736 voxels; b) Threshold was manually set using control cells at 31 and maintained the same for all images. DAPI signal was used to count the number of nuclei per field. Differentiated HT29-18N2 (Control, KChIP3-KD, KChIP3-GFP or KChIP3-MUT) cells were grown on coverslips and to visualize MUC5AC and KChIP3 colocalization, differentiated HT29-18N2 cells were washed two times, at room temperature, with PBS for 5 min. The cells were then permeabilized by incubation in a buffer (IB) containing 20 mM HEPES pH 7.4, 110 mM KOAc (Potassium acetate), 2 mM MgOAc (Magnesium acetate) and 0.5 mM EGTA (adapted from [Lorenz et al., 2008]) with 0.001% digitonin for 5 min on ice, followed by washing for 7 min on ice with the same buffer without detergent. Cells were fixed in 4% paraformaldehyde for 15 min, further permeabilized for 5 min with 0.001% digitonin in IB and blocked with 4% BSA/PBS for 15 min. The anti-MUC5AC antibody was then added to the cells at 1:5000 in 4% BSA/PBS overnight at 4°C; anti-KChIP3 antibody was added to the cells at 1:500 in 4% BSA/PBS overnight at 4°C, and the anti-GFP antibody was added to the cells at 1:1000 in 4% BSA/PBS overnight at 4°C. After 24 hr, cells were washed with PBS and incubated for 1 hr at room temperature with a donkey anti-rabbit Alexa Fluor 555 (for GFP), anti-mouse Alexa Fluor 647 (for MUC5AC or KChIP3) (Life Technologies), diluted at 1:1000 in 4% BSA/PBS, and DAPI (1:20000). Finally, cells were washed in PBS and mounted in FluorSave Reagent (Calbiochem, Billerica, MA). Images were acquired using an inverted Leica SP8 confocal microscope with a 63x Plan Apo NA 1.4 objective and analysed using ImageJ ((FIJI, version 2.0.0-rc-43/1.51 g) (Schindelin et al., 2012). For detection of the respective fluorescence emission, the following laser lines were applied: DAPI, 405 nm; and Alexa Fluor 555, 561 nm; Alexa Fluor 647, 647 nm. Two-channel colocalization analysis was performed using ImageJ, and the Manders’ correlation coefficient was calculated using the plugin JaCop (Bolte and Cordelières, 2006). To determine the volume of KChIP3 positive elements, we used the 3D objects counter v2.0 tool from FIJI (Bolte and Cordelières, 2006). All images analysed were taken on the same day under the same conditions and the same Z-step (0.29 µm). The parameters used follow: a) Size filter between 100 – 37748736 voxels; b) Threshold was manually set at 19 for both KChIP3-GFP and KChIP3-MUT cells and maintained the same for all images. DAPI signal was used to count the number of nuclei per field. Differentiated HT29-18N2 cells (Control, KChIP3-GFP and KChIP3-KD) were plated on glass coverslips, loaded with 5 μM of Fura-2AM for 30 min at room temperature, washed and bathed in an isotonic solution containing: 140 mM NaCl, 2.5 mM KCl, 1.2 mM CaCl2, 0.5 mM MgCl2, 5 mM glucose, 10 mM HEPES (305 mosmol/l, pH 7.4 adjusted with Tris). Cytosolic Ca2+ levels were measured in the absence of stimuli (for all conditions) for 15 min and 100 µM ATP added to the bath solution as indicated in the figure legend. All experiments were carried out at room temperature as described previously (Fernandes et al., 2008). AquaCosmos software (Hamamatsu Photonics) was used for capturing the fluorescence ratio at 505 nm obtained post-excitation at 340 and 380 nm. Images were computed every 5 s. Measurements were processed using SigmaPlot 10 software. Kcnip3-/- mice were generated on C57BL/6 strain (Cheng et al., 2002), and WT C57BL/6 mice were used as a control for this study (both sets of animals were obtained from Dr. Naranjo’s Lab). In order to evaluate the mucus layer under basal situation on healthy mice, 12 week old male mice were used. Specifically, six animals per genotype (wild type and Kcnip3-/- mice) were evaluated. Mice were sacrificed by CO2 inhalation and necropsy was performed to obtain the colon. Half of each intestinal segment were cleaned of faeces prior to its fixation with 10% NBF and the other half were maintained with the faecal pellets (when present) for its fixation with Carnoy´s fixative to better preserve the mucin layer. All samples were fixed overnight by incubation at 4°C and cut in 4 μm sections. Colon mice sections were stained with hematoxylin and eosin (H/E), periodic acid–Schiff (PAS) and Alcian Blue plus periodic acid–Schiff (PAS-AB) for histological analysis. PAS was used to stains neutral, acid-simple non-sulfated and acid-complex sulfated mucins (mucins are stained in purple/magenta). For the PAS-AB staining, it first stains the acidic mucins with Alcian blue; those remaining acidic mucins that are also PAS positive will be chemically blocked and will not react further. Those neutral mucins that are solely PAS positive will subsequently be demonstrated in a contrasting manner. Where mixtures occur, the resultant colour will depend upon the dominant moiety. For PAS-AB staining, acidic mucins are stained in blue, neutral mucins in magenta and mixtures in blue/purple. Full images of PAS and PAS-AB stained sections were acquired by a NanoZoomer-2.0 HT C9600 scanner (Hamamatsu) at 20X magnification, in which one pixel corresponds to 0.46 µm. The thickness of mucus layer was measured in medium and distal colonic tissue sections using the ruler tool of the NDP view + 2.50.19 software (Hamamatsu) in both PAS and PAS-AB stained sections. 20 different measures were performed in two different tissue sections per stain in both medium and distal colon. Mucus layer thickness has been evaluated in all the samples that presented faecal pellets. All data are means ± SEM. In all cases a D’Agostino– Pearson omnibus normality test was performed before any hypothesis contrast test. Statistical analysis and graphics were performed using GraphPad Prism 6 (RRID:SCR_002798) or SigmaPlot 10 (RRID:SCR_003210) software. For data that followed normal distributions, we applied either Student’s t test or one-way analysis of variance (ANOVA) followed by Tukey’s post hoc test. For data that did not fit a normal distribution, we used Mann–Whitney’s unpaired t test and nonparametric ANOVA (Kruskal–Wallis) followed by Dunn’s post hoc test. Criteria for a significant statistical difference were: *p<0.05; **p<0.01. Frontiers in Endocrinology, 4, 10.3389/fendo.2013.00129, 24065956. Journal of Internal Medicine 261:5–16. American Journal of Respiratory Cell and Molecular Biology 42:268–275. Annual Review of Physiology 70:487–512. The Journal of Cell Biology 181:143–155. International Journal of Cancer 121:1543–1549. The Journal of Experimental Medicine 208:893–900. Methods in Molecular Biology 842:229–235. Cold Spring Harbor Perspectives in Medicine 2:a009589. Molecular and Cellular Neuroscience 19:552–559. Methods in Molecular Biology 440:227–233. Journal of Biological Chemistry 280:18008–18014. Biochimica et Biophysica Acta (BBA) - Molecular Cell Research 1813:1050–1058. American Journal of Respiratory Cell and Molecular Biology 36:183–190. Bioscience Reports, 35, 10.1042/BSR20150004, 26182382. The Journal of Physiology 559:555–565. Journal of Biological Chemistry 282:1205–1215. Journal of Biological Chemistry 279:15698–15705. Journal of Biological Chemistry 277:26904–26911. Annual Review of Physiology 70:459–486. Journal of Biological Chemistry 284:9781–9787. Journal of Biological Chemistry 287:31624–31632. The Journal of Biological Chemistry 276:13810–13816. The Journal of Physiology 586:1977–1992. Thank you for submitting your article "KChIP3 coupled to Ca2+ oscillations exerts a tonic brake on baseline mucin release in the colon" for consideration by eLife. Your article has been reviewed by three peer reviewers, including Suzanne R Pfeffer as the Reviewing Editor and Reviewer #1, and the evaluation has been overseen by Richard Aldrich as the Senior Editor. The following individual involved in review of your submission has agreed to reveal their identity: Burton Dickey (Reviewer #2). Reviewer #3 remains anonymous. Cantero-Recasens and colleagues show that knocking down of KChIP3 leads to mucin hypersecretion, indicating a previously unanticipated, inhibitory role of KChIP3 in baseline secretion. In support of this notion, the authors showed that overexpression of KChIP3 WT or Ca2+ Mut inhibits baseline mucin secretion. Furthermore, the authors found that both KChIP3 WT and Ca2+ Mut associate with MUC5AC granules. Increases in Ca2+-oscillations by EGTA treatments significantly reduced the granule localization of KChIP3 WT. In contrast, KChIP3 Ca2+ Mut showed no changes upon EGTA treatments. 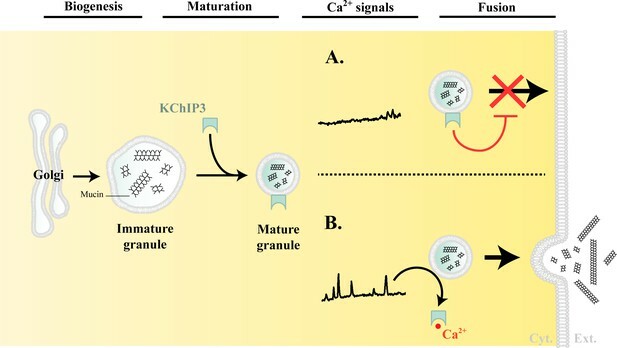 These findings have led the authors to conclude that KChIP3 is likely to be the high-affinity Ca2+ sensor for baseline mucin secretion, and they further propose that KChIP3 marks mature and primed mucin granules, and functions as a Ca2+-dependent brake for baseline mucin secretion. As noted in the reviews below, the reviewers agree that the findings are of broad interest and suitable novelty for presentation in eLife. However, they request textual clarification of a number of issues, and look forward to your suggestions how to address with their various concerns described below. Please note that all of the comments are offered to enhance the clarity of the presentation and the interpretability of the experiments shown. This is an interesting manuscript that describes the role of a novel calcium regulator that influences constitutive mucin secretion in relation to ER calcium oscillations via the ryanodine receptor. That this protein is associated with the granules and puts a brake on the process is an important contribution and my comments are offered to improve the clarity of the story. 1) Please delete "The description of our findings follows" (this is obvious). 2) Subsection “KChIP3 is required for baseline mucin secretion in colonic goblet cells”, end of first paragraph. Please provide a value for how much the protein was overexpressed. 3) Subsection “KChIP3 localizes to a pool of mucin secretory granules”, first paragraph. This reviewer does not understand what the punctae and 10-15% reflects in relation to the images shown. Please clarify. 4) Subsection “KChIP3-/- mice show increased colonic mucus layer under basal conditions”, second paragraph. Please add the word, significantly and show NS instead of a p value. 5) Subsection “KChIP3-/- mice show increased colonic mucus layer under basal conditions”, second paragraph. Is there any way that the authors can use a more specific stain than PAS or PAS-AB? Please clarify how specific this is and if needed, justify its use; it would be so much better to use an anti-mucin antibody. Or? 6) Discussion should do a better job of summarizing other people's work on calsenilin and ryanodine receptor and how the soluble protein may function or how the protein could act in relation to ER. Figure 1 – blue versus black dots are hard to see; Figure 1F – it is impossible to understand how you handled what looks to be a green smoosh and counted objects in control cells. This really needs to be explained more clearly. Did you determine total green pixels? How did you threshold this? Please clarify. Figure 1—figure supplement 2C, D. y axis should include the word, protein. More information is needed regarding how Figure 1 images were quantified. The major strength of the work of Cantero-Recasens et al. is the discovery of a possible novel regulator of mucin secretion. This is important because the discovery of new participants in exocytic events at this point in time is challenging in view of the extensive research that has been done on molecular mechanisms of exocytosis during the past three decades. As a result, most current research focuses on refinement of understanding of the roles of known participants. However, there are multiple weaknesses in the way the work is interpreted and presented, and specific suggestions are offered here to present the story with greater scholarly precision and clarity. 1) A critical issue related to the experiments requires clarification. By measuring MUC5AC in cellular supernatants, the authors detect a 2.5-fold increase in baseline secretion (subsection “KChIP3 is required for baseline mucin secretion in colonic goblet cells”, first paragraph), and other changes up and down in subsequent assays. However, there should be no measurable change in baseline (steady state) secreted mucins unless there is a secondary change in mucin gene expression, which the authors rule out. This issue is addressed in detail in Ren et al., 2015, wherein alterations in baseline secretion were analyzed in airway mucous cells in SNAP23 heterozygous knockout mice. In that paper, heterozygous loss of SNAP23 results in spontaneous intracellular mucin accumulation without inflammation or increased mucin gene expression. The increased intracellular pool brings the rate of mucin release back to wildtype, which can be conceptualized in a hydrodynamic model illustrated in Figure 7 of that paper. In fact, if one thinks about it, the steady state of baseline secretion necessarily reflects the rate of mucin synthesis or cells would become engorged until they lysed or they reduced mucin synthesis if there were a reduction in baseline secretion, or the converse if there were an increase. These issues were further explored in Zhu et al., 2015. The same reasoning calls the in vivo results shown in Figure 4, into question, and in this regard it is concerning that there is not a clear depletion of intracellular mucin stores in the intestine. Intracellular mucin depletion should be the major phenotype of an increase in baseline secretion (opposite to the mucin accumulation phenotype observed in Zhu et al., 2008, and Ren et al., 2015, in baseline secretion defective mice). The authors should carefully measure intracellular mucin in WT and mutant mice, and fully address this issue. 2) In Figure 1E, the calculation of ATP-dependent secretion from the data in D as the difference between normalized baseline and stimulated secretion for each condition does not seem justified. In Figure 1—figure supplement 1B, the full blot should be shown so the relative level of the overexpressed KChIP3-GFP fusion can be compared to endogenous KChIP3 (also, it's cumbersome for the reader to label the top row a-DREAM, which is a synonym for KChIP3, even if that is the preferred name by the vendor). In Figure 1—figure supplement 1C, is overexpression of KChIP3 really 500-fold? The figure legends are very long. 3) Regarding calcium oscillations, are the authors certain that it is the oscillations themselves that are responsible for regulating mucin secretion versus mean cytoplasmic calcium concentrations? 4) First sentence of the Abstract "Regulated secretion by specialized goblet cells in agonist-dependent (stimulated) and -independent (baseline) manners.…". If secretion is "regulated", then it should not occur in an agonist-independent manner, and it probably doesn't. The authors are correct when they assert that even baseline secretion is regulated, at least in airway cells, as demonstrated several ways. First, baseline secretion depends on the exocytic sensor of second messengers Munc13-2 (Zhu et al., 2008). Second, it depends on the second messenger calcium (Rossi, Sears and Davis, 2004). Third, it depends on the P2Y2 purinergic receptor (references in Davis and Dickey, 2008). Fourth, it depends on shear stress, probably mediated by ATP released mostly by neighboring ciliated cells during respiration (Zhu et al., 2015; Tarran R, Annu Rev Physiol, 2006). A simple way to frame this is in terms of low and high levels of agonists (or second messengers) rather than agonist-independent and agonist-dependent. Presumably there is a constitutive secretory pathway that exists in parallel to the baseline and stimulated regulated pathways, and this reviewer is aware of some presumptive molecular components of the constitutive pathway in unpublished work. (Oddly, the authors seem to have awareness of these issues because, in their prior work, Mitrovic et al., eLife2013, the authors correctly noted that "fusion of MUC5AC-containing granules with the plasma membrane requires an external signal."). Please rewrite the Abstract and Introduction with care to make these points more clearly. 5) In the second to last sentence of the Abstract, the statement "KChIP3 emerges as the long-sought high-affinity Ca2++ sensor that regulates baseline mucin secretion" is likely to confuse those in the field because KChIP3 appears to be purely a negative regulator. Syt2 was identified as the low-affinity calcium sensor in stimulated secretion in airway cells, as correctly noted by the authors. However, Syt2 is a positive regulator of stimulated secretion in both airway cells and neurons, because its deletion in airway mucous cells results in a severe reduction of ATP-stimulated mucin release (Tuvim et al., 2009) and its deletion in neurons results in a severe reduction of evoked release in neurons (Pang ZP, J Neurosci, 2006). Besides its positive activity, Syt2 also has a negative regulatory activity because its deletion in neurons results in increased asynchronous and spontaneous synaptic vesicle release, but whether it has a negative activity in mucous cells is not known. In any case, what has long been sought is the high-affinity calcium sensor that positively regulates baseline mucin secretion. While Cantero-Recasens et al. have apparently discovered an interesting regulatory pathway, they need to explain these differences with care as not to confuse the reader. 6) In the Discussion, it is stated, "in a nutshell, all that is known (about baseline mucin secretion) is that it is independent of Syt2 and is sensitive to mechanical stress." However, we also know that SNAP23 mediates both baseline and stimulated secretion (Ren et al., 2015), and that Munc13-2 regulates both processes (Zhu et al., 2008). Please cite these papers. 7) The authors go back and forth between airway and intestinal goblet cells as if they have identical mechanisms mediating and regulating secretion when in fact they don't. To begin, airway secretion, both baseline and stimulated, depends upon shear forces (airflow in vivo, liquid flow in vitro) mediated by ATP release from neighboring cells, whereas in the intestine, there is an adherent layer of MUC2. Another example is that in the intestine, sentinel goblet cells at the entrance to crypts respond to TLR signaling with massive secretion (Birchenough GM, Science, 2016), whereas no such phenomenon has been detected in the airway. Therefore, the authors should better clarify what is known in the airway, what is known in the intestine, and what, exactly, they are modeling. There is space to do this. 8) Minor issues: Subsection “KChIP3-/- mice show increased colonic mucus layer under basal conditions”, second paragraph, it is stated that an increase in the mucus layer was detected in the medial colon of four out of five knockout mice; was the fifth mouse excluded from the data analysis? In the next paragraph, the comment in Results that "our data showing an increased mucus layer in KO mice fit nicely with data obtained in vitro" is more appropriate for Discussion. 9) In the Introduction, it is confusing to state, "our genome-wide screen identified new proteins that control extracellular calcium entry into cells.… also identified was a high-affinity calcium-binding protein, KChIP3". This makes it sound as if KChIP3 regulates calcium entry, when it is subsequently demonstrated that it does not. It should also be pointed out that in airway mucous cells over short time frames, extracellular calcium does not contribute to the level of cytoplasmic calcium (referenced in Tuvim et al., 2009, and Davis and Dickey, 2008). 10) There is room for improvement in phrasing in nearly every paragraph, with some being important (see below) and some trivial, for example, starting with the Abstract, granules are not released, rather their contents are released, and this could simply be fixed as "allowing for their exocytosis". In the Introduction, they talk about "a Ca2+-mediated reaction to a gel-like form". This is likely to be very confusing to readers because the manuscript revolves around cytoplasmic calcium sensing, while the effect of calcium on mucus gel-like properties is an entirely different subject that does not come up elsewhere in the manuscript. It is true that calcium binds mucins within secretory granules, and then is exchanged for sodium in the extracellular space after mucin secretion, but it would be simplest to just drop this fact from the Introduction. In the third paragraph of the Introduction, it would be helpful to add a few words "identified new proteins, including TRPM5", to orient the reader to the prior work. “entry into the cells” is better as "entry into cells", and “vicinity of exocytic machinery” as "vicinity of the exocytic machinery". The choice of KChIP3-WT as the designation of the transgenic overexpressing line is confusing, because WT can refer either to WT sequence or WT level of expression; it would be better to designate it as OE for overexpressing or GFP since that is now inserted. Subsection “KChIP3 is required for baseline mucin secretion in colonic goblet cells”, second paragraph, it would be helpful if the authors provided a short description of circumstances when MUC5AC is expressed in colonic epithelium, such as parasite infection or ulcerative colitis, as they did in Mitrovic. The apparent rigor of statistical analysis is low. Cantero-Recasens and colleagues presented an interesting study on the impact of KChIP3 on mucin secretion. They showed that knocking down of KChIP3 lead to mucin hypersecretion, indicating an inhibitory role of KChIP3 in baseline secretion. In support of this notion, the authors showed that overexpression of KChIP3 WT or Ca2+ Mut inhibits baseline mucin secretion. Furthermore, the authors found that both KChIP3 WT and Ca2+ Mut associate with MUC5AC granules. Increases in Ca2+-oscillations by EGTA treatments significantly reduced the granule localization of KChIP3 WT. In contrast, KChIP3 Ca2+ Mut showed no changes upon EGTA treatments. These findings have led the authors to conclude that KChIP3 is likely to be the high-affinity Ca2+ sensor for baseline mucin secretion, and they further proposed that KChIP3 marks mature and primed mucin granules, and functions as a Ca2+-dependent brake for baseline mucin secretion. In general, the experiments in this study were carefully designed and well executed. The inhibitory activity of KChIP3 on baseline mucin secretion is nicely shown. A potential weakness of this study is the link between Ca2+ and the dissociation of KChIP3 from granules. KChIP3 granule localization is interesting, and this appears to be the main evidence for the proposed mechanism underlying KChIP3 inhibition. However, it is unclear to this reviewer what is the mechanistic nature behind the reduction of KChIP3 localization upon the EGTA treatment. For example, KChIP3 is a multifunctional protein that binds proteins and DNA, and it regulates gene expression in a Ca2+-dependent way. Can the authors exclude the possibility that the changes of KChIP3-granule localization are due to alterations of protein/membrane components of granules on a longer timescale? Also, have the authors tried to block granule exocytosis by knocking down SNAREs (e.g., VAMP8)? Does an impairment of granule exocytosis inhibit KChIP3 dissociation? At this stage, further evidence to support the model in Figure 5 would be helpful. In Figure 3, the authors presented data on KChIP3 staining using permeabilized and washed cells. While it is clear that some KChIP3 proteins are co-localized with granules, the degree of KChIP3 granular/cytosolic localization is unclear. What percentage of total KChIP3 is on granules? Without washing, could the authors observe KChIP3 WT and Ca2+ Mut on docked granules (e.g., by TIRF)? Does the EGTA treatment change KChIP3 localization in intact cells? It would be helpful to know whether the EGTA treatment alters KChIP3 distribution by triggering complete dissociation or by changing the tightness of KChIP3-granule interactions. Thank you for submitting your article "KChIP3 coupled to Ca2+ oscillations exerts a tonic brake on baseline mucin release in the colon" for consideration by eLife. The authors have very thoughtfully responded to the detailed reviewer comments. However, this monitoring editor would strongly encourage the authors to incorporate most of their responses directly into the manuscript text in the Results section. If a reviewer expert has a question or is confused, other readers will too, and discussion of the issues in the paper will greatly improve the manuscript. For example, please state in the legend, "Shown are Z-stack projections but quantification utilized data from individual stacks using 3D analysis software." A reader should not need to go to the methods to figure this out. With this suggestion, the paper will represent an important contribution to the field overall. This statement is now removed from the text. In order to study the localization of KChIP3 in HT29 differentiated cells, we used the KChIP3-GFP cell line and detected, by confocal immunofluorescence, the signal of both KChIP3 and MUC5AC. Next, we studied the colocalization between these two proteins using FIJI software for all z-stacks. Our data show that 10-15% of total MUC5AC containing granules detected by immunofluorescence (IF) contain KChIP3-GFP. However, the images shown in Figure 3 and Figure 3—figure supplement 4 represent an apical single plane and, therefore, not all mucin granules are visible. We have made the changes as suggested. PAS and PAS-AB are commonly used to stain both acidic and neutral mucins. Although it is true that PAS technique is also used for the detection of glycogen and other glycoproteins, the combination of both PAS and Alcian-Blue is, by far, the most sensitive method to detect mucins, since all mucins are detected regardless of their charge. Since our data (Figure 1 and Figure 1—figure supplement 2) show that KChIP3 has similar effect on both MUC2 and MUC5AC export, staining the sections with a specific mucin antibody will not provide any valuable information. Another key issue is that due to hyperglycosylation of mucins (80% sugars and 20% polypeptide), their detection by immunohistochemistry is technically very challenging. This would be a huge undertaking without the possibility of a convincing result better than the data presented. Figure 1 – blue versus black dots are hard to see. We have changed the shape and color of blue dots. Figure 1F – it is impossible to understand how you handled what looks to be a green smoosh and counted objects in control cells. This really needs to be explained more clearly. Did you determine total green pixels? How did you threshold this? Please clarify. The images are z-projections, but we quantified all the z-stacks using FIJI software. We have now included a new paragraph in the Materials and methods to explain this procedure as shown below. We have included the word “protein” on the y-axis. As stated before, now we include a new paragraph in the Materials and methods explaining how images were quantified. As shown in Figure 1F, knock-down of KChIP3 in HT29 cells results in a reduction of intracellular MUC5AC staining, in accordance with the phenotype of an increase in baseline secretion that should produce a depletion of intracellular mucins. In the colon of the KChIP3 KO mice we observed a clear increase in the colonic mucus layer thickness. However, it was not possible to measure intracellular mucin staining. The only possibility was to measure mucin staining of the colonic epithelia, which includes goblet cells, the epithelium lining and the mucins secreted in the colonic crypt tube using the Positive Pixel Count Algorithm. Briefly, a region of interest (ROI) of colonic epithelia was selected for each image and pixels segmented in positive (PAS or PAS-AB positive pixels) or negative (rest of the pixels), and then analyzed as the percentage of positive pixels (number of positive pixels*100/(positive pixels+negative pixels)). However, since it was not possible to distinguish between the mucins secreted into the colonic crypt tube and the intracellular mucins, there was no observable difference between the WT and KChIP3 KO mice. Therefore, the only way to quantify the differences in intracellular mucins between the KO and the WT mice would be to isolate the colonic cells, harvest and visualize by immunofluorescence and/or dot blotting with anti-mucin antibodies (after extensive washing to remove all secreted mucins). However, this is technically challenging and likely to introduce artifacts: the process of isolation might trigger mucin release and yield a false report. Importantly, we show that in the tissue culture cells, there are fewer intracellular granules in KChIP3 depleted cells, so it is very likely that this event is reproduced in the mouse KO, but at this stage beyond our abilities to test for the reasons stated above. 2) In Figure 1E, the calculation of ATP-dependent secretion from the data in D as the difference between normalized baseline and stimulated secretion for each condition does not seem justified. We decided to use the difference between baseline and stimulated secretion to calculate the real contribution of KChIP3 to ATP-mediated mucin secretion since in our experimental approach stimulated secretion also includes baseline secretion. In the case of KChIP3-KD cells there is an apparent increase of stimulated mucin secretion, which is due to an increase in baseline secretion. We therefore calculated ATP-dependent mucin secretion as the difference between stimulated and unstimulated secretion. In Figure 1—figure supplement 1B, the full blot should be shown so the relative level of the overexpressed KChIP3-GFP fusion can be compared to endogenous KChIP3 (also, it's cumbersome for the reader to label the top row a-DREAM, which is a synonym for KChIP3, even if that is the preferred name by the vendor). Using available commercial antibodies against KChIP3, we have been unable detect endogenous KChIP3 by WB. We therefore show the band corresponding to the overexpressed KChIP3 (using anti-KChIP3 and anti-GFP antibodies) as a means to represent the KChIP3 levels. We have changed the label from a-DREAM to a-KChIP3. In Figure 1—figure supplement 1C, is overexpression of KChIP3 really 500-fold? In Figure 1—figure supplement 1C, there is a 500-fold increase in KChIP3 RNA levels (normalized by GAPDH levels) in KChIP3 overexpressing cells compared to control cells. We have changed expression levels to relative RNA levels on the y-axis. The figure legends are very long. We have shortened the figure legends as shown below. We propose that to promote baseline mucin secretion, intracellular calcium needs to reach a certain threshold (which would depend on KChIP3’s Ca2+ binding properties). This threshold is reached by Ca2+ oscillations generated upon RYR mediated Ca2+ release from the ER, which is in close proximity to mucin granules in goblet cells (Tuvim, 2009). So, Ca2+ oscillations are likely generated in the proximity of mucin granules and not diffused throughout the cytoplasm. It is also possible that not all oscillations trigger mucin secretion, but only those that exhibit a higher level. Therefore small increases in mean cytoplasmic calcium concentration are likely not sufficient to trigger mucin secretion. Besides, KChIP3-KD cells show increased and KChIP3-GFP cells show decreased baseline mucin secretion despite presenting no differences in mean baseline cytoplasmic calcium concentration (Figure 2—figure supplement 1C and 1D). If secretion is "regulated", then it should not occur in an agonist-independent manner, and it probably doesn't. The authors are correct when they assert that even baseline secretion is regulated, at least in airway cells, as demonstrated several ways. First, baseline secretion depends on the exocytic sensor of second messengers Munc13-2 (Zhu et al., 2008). Second, it depends on the second messenger calcium (Rossi, Sears and Davis, 2004). Third, it depends on the P2Y2 purinergic receptor (references in Davis and Dickey, 2008). Fourth, it depends on shear stress, probably mediated by ATP released mostly by neighboring ciliated cells during respiration (Zhu et al., 2015; Tarran R, Annu Rev Physiol, 2006). A simple way to frame this is in terms of low and high levels of agonists (or second messengers) rather than agonist-independent and agonist-dependent. Presumably there is a constitutive secretory pathway that exists in parallel to the baseline and stimulated regulated pathways, and this reviewer is aware of some presumptive molecular components of the constitutive pathway in unpublished work. (Oddly, the authors seem to have awareness of these issues because, in their prior work, Mitrovic et al., 2013, the authors correctly noted that "fusion of MUC5AC-containing granules with the plasma membrane requires an external signal."). Please rewrite the Abstract and Introduction with care to make these points more clearly. 5) In the second to last sentence of the Abstract, the statement "KChIP3 emerges as the long-sought high-affinity Ca2+ sensor that regulates baseline mucin secretion" is likely to confuse those in the field because KChIP3 appears to be purely a negative regulator. Syt2 was identified as the low-affinity calcium sensor in stimulated secretion in airway cells, as correctly noted by the authors. However, Syt2 is a positive regulator of stimulated secretion in both airway cells and neurons, because its deletion in airway mucous cells results in a severe reduction of ATP-stimulated mucin release (Tuvim et al., 2009) and its deletion in neurons results in a severe reduction of evoked release in neurons (Pang ZP, J Neurosci, 2006). Besides its positive activity, Syt2 also has a negative regulatory activity because its deletion in neurons results in increased asynchronous and spontaneous synaptic vesicle release, but whether it has a negative activity in mucous cells is not known. In any case, what has long been sought is the high-affinity calcium sensor that positively regulates baseline mucin secretion. While Cantero-Recasens et al. have apparently discovered an interesting regulatory pathway, they need to explain these differences with care as not to confuse the reader. We have changed the sentence in the Abstract to: " KChIP3 therefore emerges as the high-affinity Ca2+ sensor that negatively regulates baseline mucin secretion." Moreover, we have included a new paragraph in the Discussion to clarify the role of KChIP3 as a negative regulator of baseline mucin secretion. We have included the references suggested in the text. We have included a new paragraph on the Discussion. We did not exclude the fifth mouse from the data analysis, since it was included in the analysis of distal colon and there was no objective reason to do so. By removing this mouse the differences in the medial colon between WT and KO mice become statistically significant for both PAS and PAS-AB staining. We have removed the sentence from Results. The description of the statistical analysis is included in the Materials and methods and assessed to the best of our abilities. Although we cannot completely rule out the possibility that KChIP3 localization is affected by alterations in the chemical composition of the granules, the fact that KChIP3-MUT (that cannot bind Ca2+) has a similar localization which is not affected by Ca2+ levels points to a fast effect of Ca2+ treatments on KChIP3 localization. Also the time of our experiments (30 min) makes it unlikely that the effect of Ca2+ treatment on KChIP3 localization is due to alterations in membrane compositions. We have not tested the effect of SNAREs KD (like VAMP8, SNAP23 or the exocytic regulatory protein Munc13-2 that are known to control baseline mucin secretion) in KChIP3 cell lines. Interestingly, all these SNAREs identified so far control both baseline and stimulated mucin secretion in the airways. However, the specific Syntaxin for baseline or stimulated mucin secretion remains unknown. Our immediate goal is to identify the syntaxin protein involved in baseline secretion and then test whether its depletion triggers accumulation of granules in KChIP3 lacking cells. We also believe a better understanding of how KChIP3 is recruited to the granules by identification of its binding partners, will help address this issue more convincingly. But these studies are beyond the scope of this paper. Our first experiments using non-cytosolic washed KChIP3-GFP cells showed cytosolic KChIP3 localization with some brighter punctae of KChIP3, so we decided to check its localization by first removing all non-membrane bound cytoplasmic protein. We hypothesize that binding of Ca2+ to KChIP3 (provided by calcium oscillations that reach a certain threshold) changes its conformation and thereby affects its interaction to mucin granules. For example, it is known that binding of Ca2+ to KChIP3 releases it from DRE sites (where it acts as a transcriptional repressor) in neurons (Carrión, 1999). However, whether this possible conformational change after binding Ca2+ triggers dissociation from the granules, alters the binding affinity of KChIP3 to granules, increases the probability of its release, or produces a change in its binding partners are beyond the scope of this paper. We thank all members of the Malhotra Lab, especially Ishier Raote, for valuable discussions. Cell sorting experiments were carried out by the joint CRG/UPF FACS Unit at Parc de Recerca Biomèdica de Barcelona (PRBB). Fluorescence microscopy was performed at the Advanced Light Microscopy Unit at the CRG, Barcelona. V.Malhotra is an Institució Catalana de Recerca i Estudis Avançats professor at the Centre for Genomic Regulation. This work was funded by grants from the Spanish Ministry of Economy and Competitiveness (BFU2013-44188-P to VM, SAF2015-69762R to MAV and SAF2017-89554-R to JRN) and FEDER Funds. We acknowledge support of the Spanish Ministry of Economy and Competitiveness, through the Programmes “Centro de Excelencia Severo Ochoa 2013- 2017” (SEV-2012-0208 & SEV-2013-0347) and Maria de Maeztu Units of Excellence in R&D (MDM-2015- 0502). This work reflects only the authors’ views, and the EU Community is not liable for any use that may be made of the information contained therein. Animal experimentation: Animal care was conducted in accordance with standard ethical guidelines (European Communities Directive 86/609 EEC; National Institutes of Health 1995). The CNB-CSIC and Community of Madrid ethical committees approved experiments with mice (PROEX 28/05). © 2018, Cantero-Recasens et al.